This family-based music festival, founded by Robert and Rolande Schrade and named after the first letter of their names and those of their five children, celebrates its 50th anniversary season this summer. 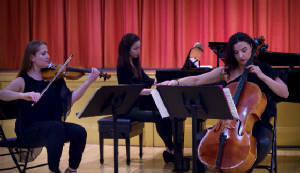 Most programs feature at least one family member, and in this season’s fourth concert that was pianist Lynelle James, a granddaughter of the founders, along with her colleagues in the Piazzolla Trio, Israeli-American violinist Anat Malkin Almani and founding Albanian-American cellist Gjilberta Lucaj. They led off with an elegant account of Mozart’s B-flat Trio, K. 502, written at the height of his thirty-year-old maturity in 1786. All three were lively in the opening “Allegro,” flowing in the serene “Larghetto,” and fleet in the closing “Allegretto” movement. Following in stark contrast and closing the concert’s first half was Rachmaninoff’s early Trio Elegiaque No. 1, written in 1892, when he was still a nineteen-year-old student. The trio’s intense performance of this 15-minute single-movement piece found more passion and depth in it than either of the readily available recordings. The program’s second half, including a brief encore, consisted entirely, and unsurprisingly, of music by the trio’s namesake, and it was a rare treat to hear it in such a concentrated dose. As Lucaj told the audience, Astor Piazzolla’s legendary French music teacher, Nadia Boulanger, identified and nurtured his gift to create a new form of classical music based on the tango rhythms of his native Argentina. This gift was immediately apparent in the trio’s luscious rendition of the seductive “Oblivion,” one of Piazzolla’s most popular tangos. The lesser-known tango “Muerte del Angel” (The Angel’s Death) begins with an inventive three-voice fugue, which was grippingly executed by the trio. The major work they presented was the composer’s colorful “Four Seasons of Buenos Aires,” which in their three-part structures replicate the design of Vivaldi’s famous “Four Seasons” cycle of three-movement concertos two centuries earlier. The sound effects cleverly reflect the weather of each season, which the trio depicted with technical prowess and interpretive finesse. The free home-baked treats during Sevenars intermissions further deepen the joy of music-making in this exquisitely intimate environment.